Twice a year, the tree in our front yard explodes with fragrant white flowers that perfume the neighborhood with eau de Hawaii. You can smell it from two blocks away, and thankfully, it's a nice smell. We aren't sure what kind of tree this is. One tree-trimmer guessed acacia, and google seems to agree. 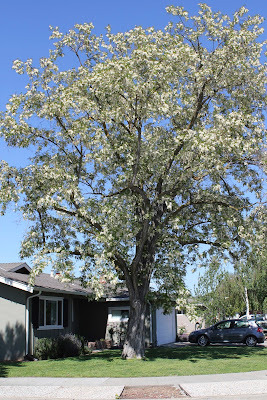 I wish the tree was like this all year long, but it only lasts about two weeks, and then the wind kicks up and all the blossoms blow into our neighbors' yards. One neighbor suggested we cut the tree down for this reason. It's impolite to give your neighbor the finger, so I just said no. 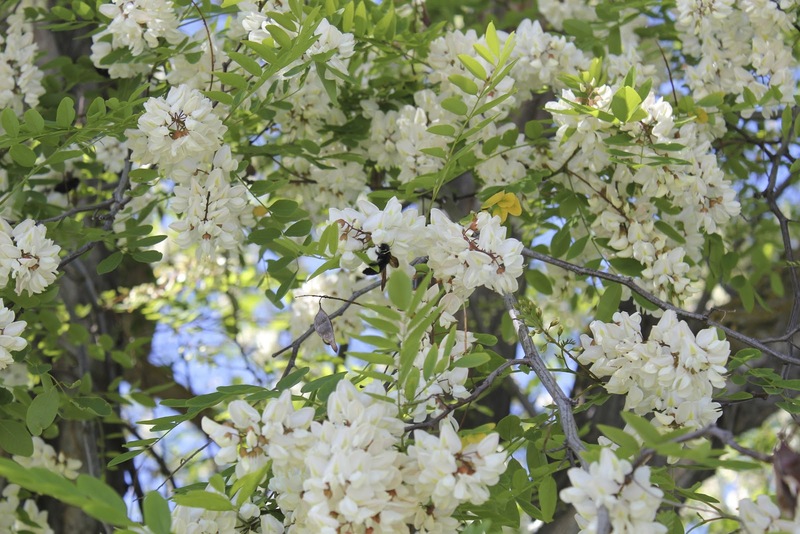 For the two weeks the blossoms are on the tree, the whole thing hums with hundreds of bees. 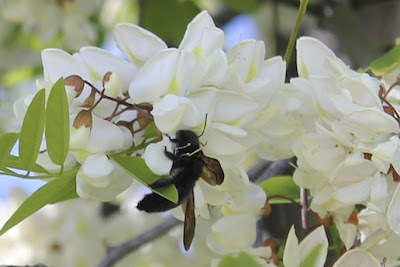 Some are honey bees, some are big and black -- carpenter bees, I guess? The only problem with this tree is that it's not in my back yard. I'd like to lie in its shade and stare upward for a while. 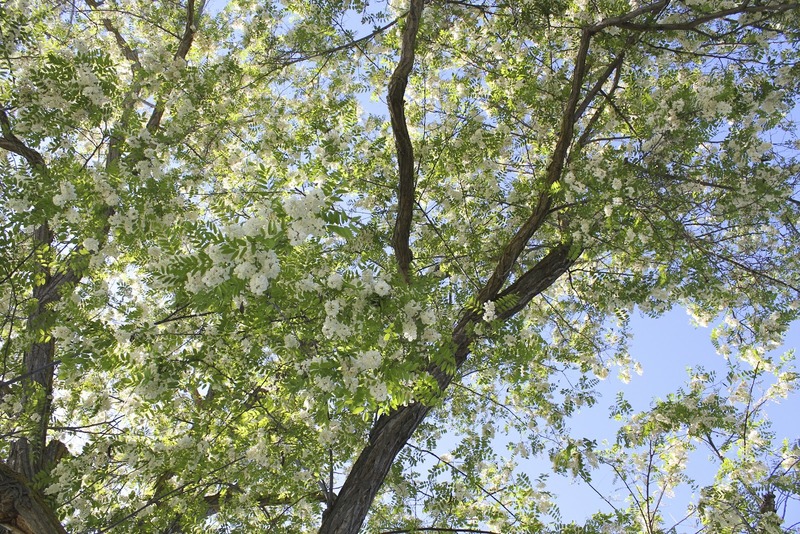 We have five crab apple trees on our property. Two white, two pink, and one that is a really lovely color of magenta. 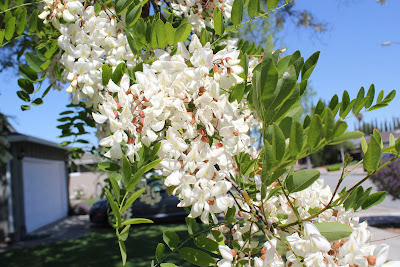 They flower every spring, and much like your tree it only lasts about two weeks or so. The smell is heavenly. The petals that cover everything, not so much, but worth it in my opinion. The first year we lived in the house and the flowers bloomed, my daughter Mack turned into a red eyed, crying mess of allergies. Thank goodness she grew out of them. smells like hawaii? ahhh i want. its a beauty and id say worth those two weeks. we removed a huge oak tree in our backyard at the request of our neighbor (it was 99% in their yard, with just the trunk in ours) they split it with us...and it took us 3 years to bite the bullet. so eff them! You are so lucky. 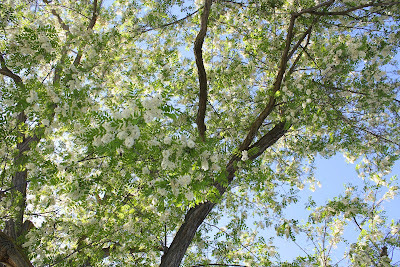 The trees blooming in our neighborhood smell like feet. Apparently bees love it though, because it keeps getting pollinated.